The snaplock® seam system is extensively used in Europe and the United States of America, where the system has proved itself in the extremely varied climate. Our system gives an aesthetically pleasing finish whilst avoiding the industrial finishes found in other seam systems. Seams are available in 25mm / 38mm formats, in copper, stainless steel or precoated aluminium and can be supplied with all the necessary traditional flashings and accessories. The Snaplock® seam system can be laid on a ventilated timber substrate, composite panel or direct on insulation, using special warm roof fixing clips (see Products). 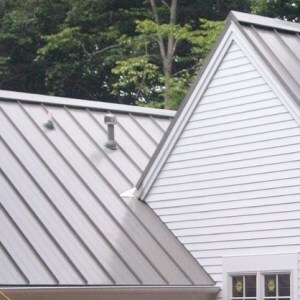 Snaplock® is much simpler and requires less skill / hand tools than the traditional standing seam.